Amethyst Sage - It's variations, colors, patterns etc, how to cut, polish, etc. 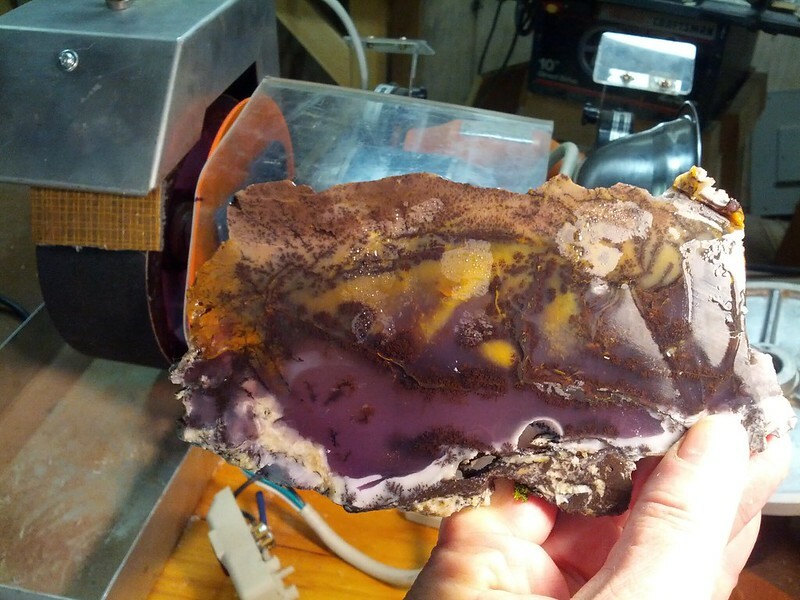 Lapidary / Gemstone Community Forum > Forum > Stone Talk > Share Our Finished Cabochons and General Cabbing Questions / Tutorials > Amethyst Sage - It's variations, colors, patterns etc, how to cut, polish, etc. Re: Amethyst Sage - It's variations, colors, patterns etc, how to cut, polish, etc. WOWSER... TNTMOM has talent... I love the two tear drops, the last one best. Perfect choice in shape for the cabochon and what a great finish on them. So many people just see how many cabs they can get out of a slab. Designer pieces come from finding the perfect image in the slab and making it into a piece of art. Glad I found you folks. Yes, I liked all the other cabs as well. Now if I can just find out why some of my pictures will not post I will start sharing some of my work as well. 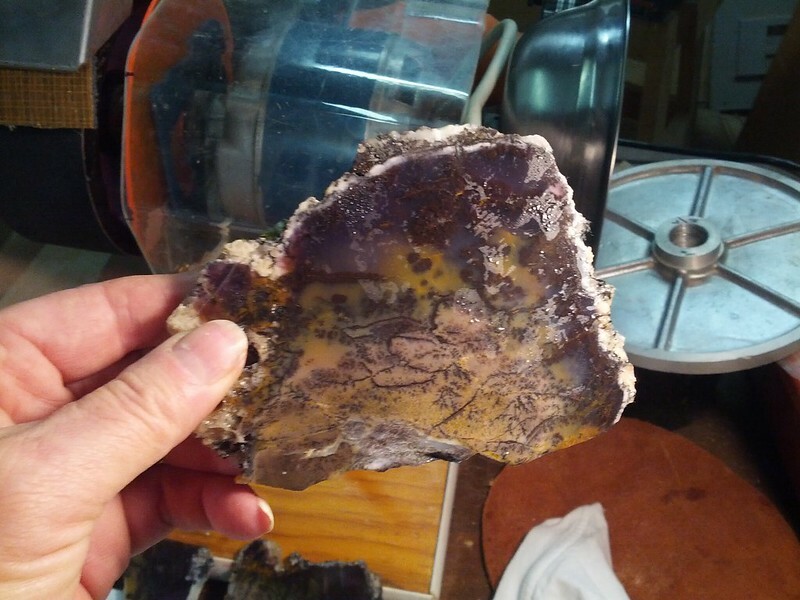 As far as I know, Amethyst Sage is from the same location as the old Denio Dendritic agate. It just came out as Amethyst Sage when the purple variety made it to market. Without the color showing, it is very similar to a number of other dendritic agates found at other locations. I just think Amy Sage is more popular and looks better because of the color. I know I love the stuff enough so my wife has to set the budget for me....haha. I finished up the sister slab cab to one of the cabs above and the round I showed with the stencil. Where is everyone elses Amethyst Sage? This material is so different depending on each artists eye. It is wonderful material to view and so different with each cab! I own this cab now! Holy smokes it's more gorgeous in hand than in the pictures! Now I just need to plan a fitting design for it! WOW Nancie!!!! GORGEOUS SLAB!!!!! Tony rocks! All of my cabs came from his material too! Still want to know exactly what the stuff is, though. Doesn't it have to show purple to be called "ame?" Mn oxide dendrites in what, brecciated jasper, opal, agate, or amethyst? Crystalline or cryptocrystalline, hardness, toughness, does it undercut, need special polishing techniques? Thanks to everybody posting pics, it's appreciated! It's kinda weird stuff and varies piece to piece one rough to another. It's variable nature put me off at first but grew too like it. Some of the brown/tan nodules are more jasper like with dendrites, manganese is the colorant in the dendrites and amethyst color in the pieces that show violet. It is cryptocrystalline quartz and seven in hardness. Pieces that have some of the white opal included in them can undercut. Other pieces are white or grey agate. No special cutting techniques- as most agates diamond or silicon carbide will work.Tin or Cerium for polish- i like polish oxides on suede leather but opinions will vary. You can also run it all the way out with Diamond abrasive. I want some rough! Wow, that material is spectacular. Wow! NIIIIIIIICE! The box I bought from Tony didn't have anything even close to that! You made out like a bandit!! !